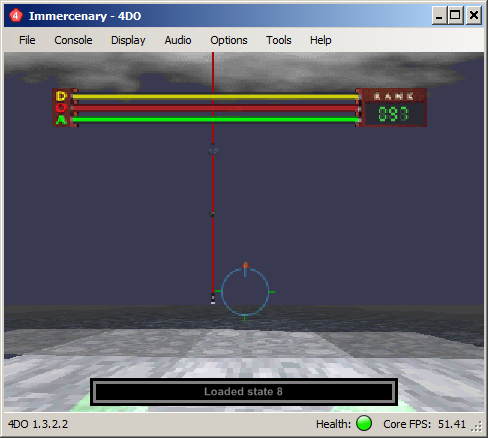 4DO – An open-source, low-level emulator based on the FreeDO source code. Fixes may affect other games too? 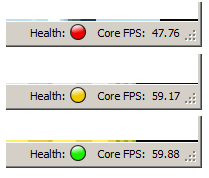 Added support for anvil-bios. Anvil chip emulated, needed to run some games of the European region. 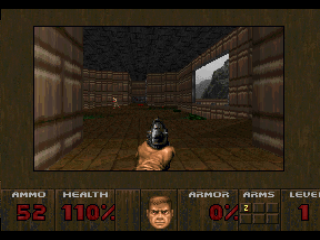 Viktor, who has contributed numerous 4DO improvements (including core emulation fixes), has been working on an android version of the emulator. He has been hard at work and could use your help with beta testing! Viktor has a forum thread on the topic, please get in touch with him if you’re available to help! If you’re unavailable to help with testing, perhaps just say hello and cheer him on! Added emulation notification messages – These show up at the bottom of the screen for things such as “Save State” and “Screenshot saved”. There is also a setting under the General tab to turn them off. Emulation performance optimization – about a 5-10% improvement. Input/Controller setup screen now shows a textual form of what button or function you’re currently pressing (“A Button”, “Save State”) in addition to the yellow halo over the button. Added ability to reset all bindings to defaults. Added ability to bind to an “Exit” console function, to exit the emulator. Fixed bug in which the default input bindings were blank if starting 4DO for the first time. 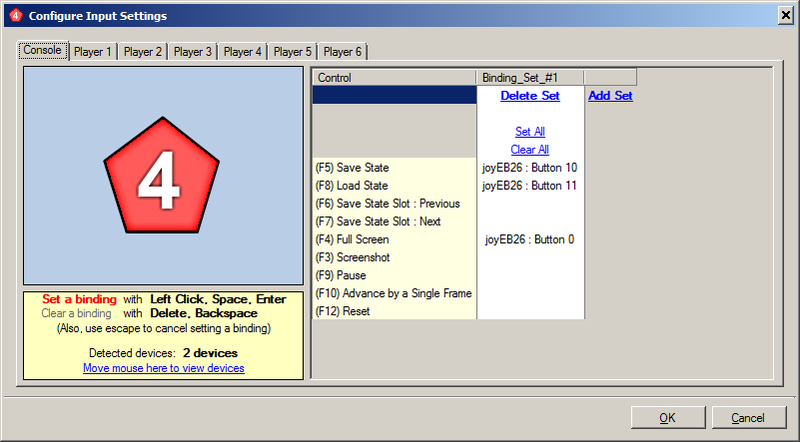 Fixed bug in which controller 6 input bindings were unavailable. Some minor usability improvements to file browser (added “x files selected” message, and using “up directory” button will highlight the folder you came from). 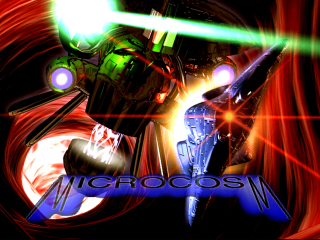 Browse for and extract files from your 3DO games! 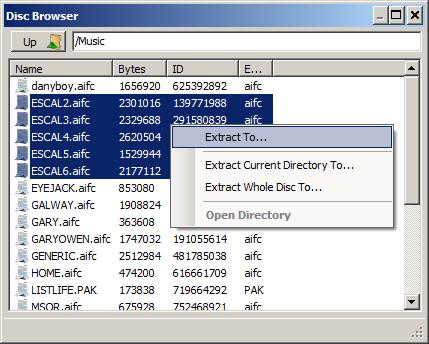 File Browser Added – Available through the new “Tools” menu, the file browser allows users to browse the current disc’s file system and extract files. This can be used to find music, sound clips, images, videos, etc. German Language Fixed – German is now actually available. The previous release did not properly include a necessary file in the release package. The files are often unusual formats, so you will most likely have to find tools for converting them. Some quick fixes to the 1.3.0.0 release. Olympic Summer Games fixed – Olympic Summer Games now boots and is playable. Crash ‘n Burn fixes isolated. Several games in 1.3.0.0 were crashing as a result of the game-specific changes. Viktor has modified the Crash ‘n Burn changes so that they are game-specific rather than system wide. 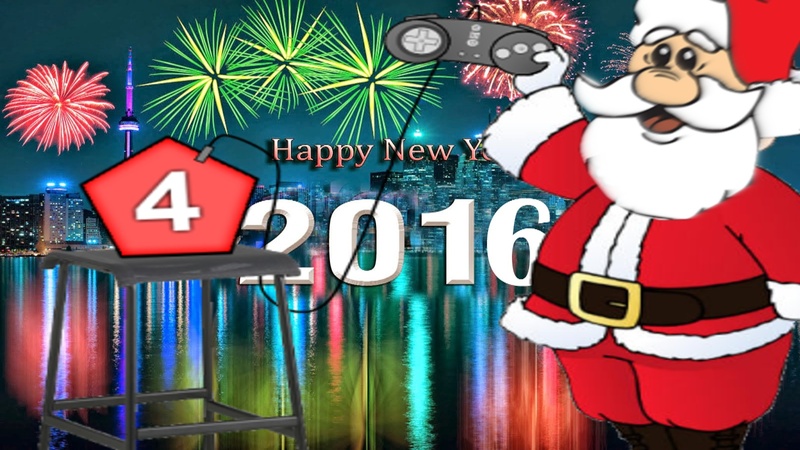 3DO History has been made today! 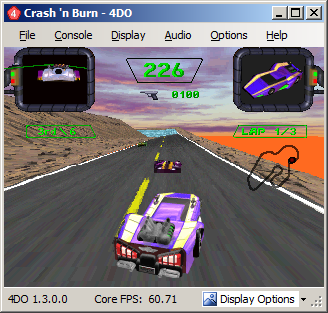 Viktor worked long and hard to add support for Crash’n Burn, making it fully playablefor the first time on any emulator! This is the result of a lot of difficult, meticulous debugging! Crash ‘n Burn support – See additional notes below. The Advanced Settings’s ARM CPU Overclock option now allows users to increase it further, to clock speed up to 50Mhz (400%). Auto-cropping previously was ignoring the blue channel when detecting black pixels. This has been fixed. Russian translation improvements, also from Viktor. Translation fix on settings screen for autocrop setting. The fix is pretty complicated, so you may run into a few bugs. When selecting to start a race, sometimes the game will still reboot similar as it did before. Additionally, audio for video clips in racer selection screen sometimes improperly synced. However, the game itself is fully playable! Some good updates! Primarily bug fixes, but also a new UI feature! Sewer Shark and Night Trap were experiencing a startup issue in 1.2.0.2. this is now fixed. 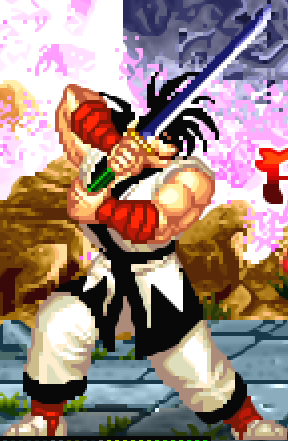 Slam ‘n Jam 95 was crashing after the Samurai Shodown improvements in 1.2.0.2. This is now fixed. 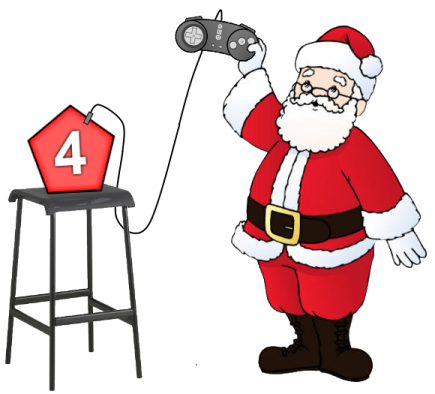 4DO now detects additional types of input devices. For example, a PS3 controller set up through MotionJoy now works as intended! Cropping will perform at most 25% on each side. If the user has specified to preserve aspect ratio, crops may result in an aspect ratio different than native. This is automatically expanded to the available area. 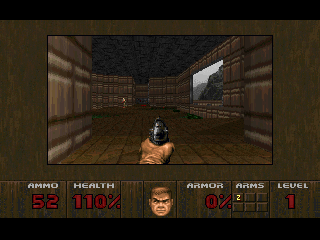 Thus, games that attempt to simulate widescreen can actually be played in the intended widescreen format. 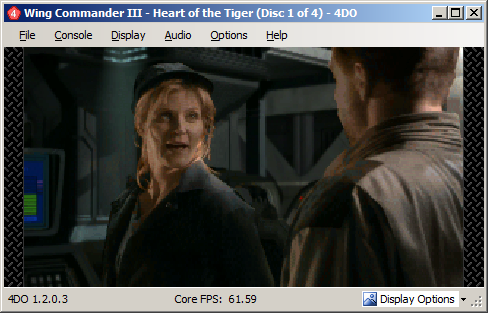 An example of this is apparent in the screenshots of Wing Commander III above. Auto-cropping will only increase the amount of screen cropping if the available cropping detected remains constant for 1 second. Cropping detects black and near black colors; colors within about 6% of black are also considered black. If the crop for any side is detected to have been too much for any side, it is immediately expanded appropriately; thus, non-black pixels are always made visible. I first saw the need for this feature when I played through Lucienne’s Quest. 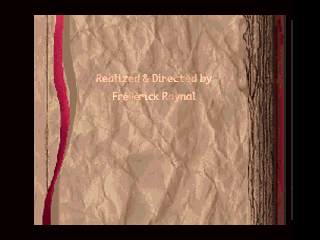 I’ve come to find that several games I’ve played benefit from removing this border: Wing Commander III, Daedalus Encounter, Alone in the Dark 1 & 2, AD&D Slayer, and pretty much any FMV game!